I was a temporary android consort… but my (male) client was all too human. In 2019, Pennie Lane accepts a far-fetched and high-paying assignment to impersonate a sophisticated android prototype for one full day. The actual floor model android has developed a last-minute glitch but the evaluation by the billionaire buyer must go on. As the minutes tick by, more glitches become evident (and so does fractiousness within the company, Delos Echo International). Pennie learns there has been corporate sabotage… and possibly other breaches. With her fresh eyes assessing both the android and the Delos Echo employees, Pennie believes she knows which company insider is guilty and even suspects what crimes may have been committed. After the first hours, the MA/F-9.0 still isn’t ready and Pennie is told to stall the wealthy buyer… no matter what it takes. 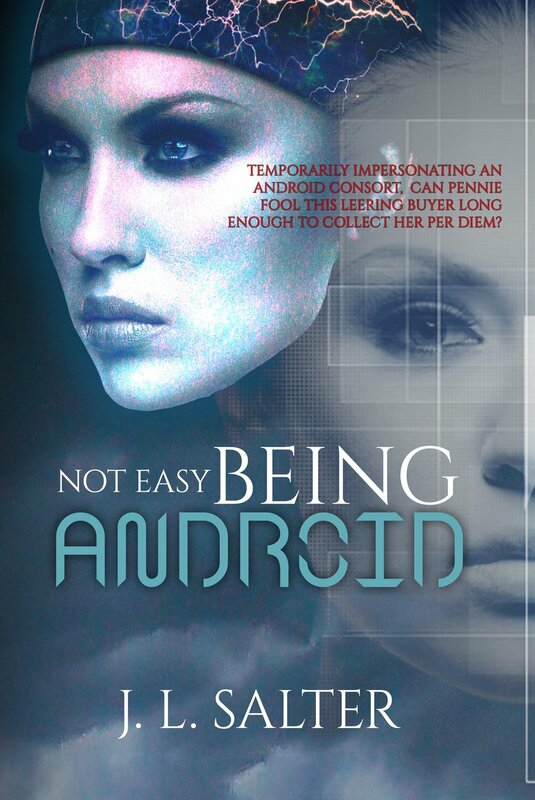 But the buyer, Knox Kendall, already seems suspicious that Pennie’s MORE than an android and (when he inspects very closely) she’s not that good of an actress. Besides this wealthy purchaser is the handsomest (and most virile) man she’s ever been around. But he’s also demanding an intimate inspection of this female android’s companionship mode. And he doesn’t mean how well she plays checkers.